Texas has more than 80 state parks, the majority based around an artificial lake so not scenically interesting, but a few contain more unusual landscapes such as Hueco Tanks State Park and Historic Site, 30 miles east of El Paso in the far west corner of the state. The park is small in extent, just 1 by 1.5 miles, and contains a weathered outcrop of syenite granite, its surface heavily cracked and eroded forming narrow ravines, small arches, rounded boulders and short but sheer cliffs, and the dual designation reflects the two competing reasons why the area is significant. One is as a rock climbing destination, since the hard, pockmarked granite is ideal for bouldering (ropeless, short ascent climbing), while the Historic Site status is to protect the thousands of pictographs, petroglyphs and other historic inscriptions that are found all over the granite - the mountain sits close to a long-established cross-country trade route and the many cavities ('huecos') on top of the hills collect and hold rainfall, and so provide a dependable source of drinking water even during the long hot summers, hence this location has been an important stop for travelers for many centuries. 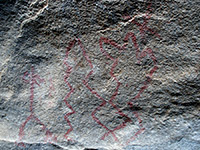 Because of the delicate nature of many of the pictographs, most of the park is open only to guided tours, leaving just one of the four separate summits (North Mountain) explorable by unaccompanied hikers, and even here all visitors must first view a video with detailed regulations, and sign a form to confirm compliance. Besides viewing the artwork, even for non-climbers it is easy and fun to scramble up the less-steep slopes of the mountain, and explore the crevices and eroded formations; the summit gives good views over the desert surroundings, wildlife (principally snakes and lizards) is quite abundant and there are plenty of desert plants including echinocereus cacti that produce brilliant orange flowers in early summer. The six mile road to Hueco Tanks State Park forks northwards off US 62/180 at the village of Hueco Mountain, right at the east edge of greater El Paso - scattered development extends along the highway all the way to the city center but there is very little eastwards until Carlsbad, NM, 130 miles away. The side road passes residences and a few Hueco-related businesses, plus a lot of ruined buildings, abandoned vehicles and other trash. The mountain comes into view after a few miles, looking like a big heap of randomly placed boulders, grey-brown in color, surrounded by flat, sandy scrubland and with higher, more conventional-looking hills in the distance (the main part of the Hueco range). The rather convoluted entrance process, all just for the northern quarter of the park, first involves payment of the $5 admission fee and signing a register to get a ticket, then, after driving to a separate building, presenting the ticket to gain admission to a video presentation mostly about the history of the tanks but ending with a list of the regulations. After signing again to confirm viewing, the visitor is given a card that allows entry for the next 12 months without having to sit through the orientation video again. The total number of people allowed in the park at any one time is limited to 230, hence reservations might be necessary at popular times during spring and fall. The park map shows the general position of seven of the easiest-reached pictographs though not in sufficient detail to locate them reliably; visitors have to hunt around a bit, or ask for more precise directions. The majority are near ground level, as the native peoples spent most time here, rather than up in the rocks. 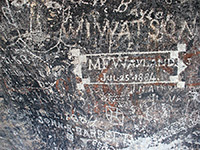 Closest location is right behind the interpretive center in a small cave, the walls of which have a number of rather faint red and black drawings, next to more recent graffiti, as seems to be the case for most of the North Mountain sites. The later writings date back to the mid 19th century, continuing right through to the 1960s and 70s, after which modern restrictions and protection efforts appear to have taken effect. 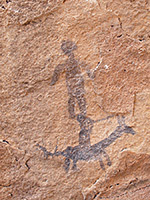 Other North Mountain pictographs include abstract shapes, hunting scenes and animals, and the majority are rather faded; artwork on the restricted South and East Mountains is often better quality, and has more unusual designs like masks and human effigies. The drawings are still not quite as good as many places in south Utah, which are much harder to reach but also not subject to the same restrictions; the limitations at Hueco Tanks are due to the ease of access and proximity to the major city of El Paso. The surface of the mountains harbor many cavities, the majority dry in summer but some hold water all year. 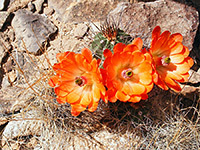 The most colorful plant is orange-flowered echinocereus triglochidiatus; also found on the rocks are opuntia, ocotillo, sotol, soaptree yucca and lechuguilla, while other plants like willow, cottonwoods and oak inhabit moister places at the edge of the granite. There are many easy routes to scramble up to the summit of North Mountain, gaining 250 feet in elevation, and hence look out across many miles of the surrounding flat lands, towards the Hueco Mountains in the north and much empty desert in the south. Climbing locations are spread all around the rocks; there are hundreds of recognized routes on North Mountain alone, many first identified in the 1980s and 1990s. Because of the mild climate the park is especially popular as a winter climbing destination. El Paso has many hotels; closest are about 25 miles from Hueco Tanks, along US 62/180 near the international airport, or beside I-10.